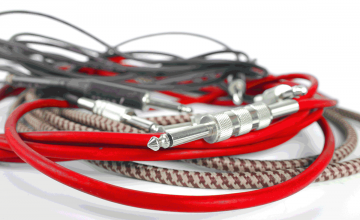 We offer a range of services from on site sales in strings,skins,sticks n pics etc . Based in Pershore we are conveniently located from Junction 6 of the M5. Teaching on all instruments from beginner to pro standard. All lessons are structured and thorough with work sheets given. Lessons are conducted on a one to one basis. Once Student is at a playing standard they have the choice to embark on the rockschool syllabus. Here they can attain there exam grades w..ith the worldwide exam board rockschool. 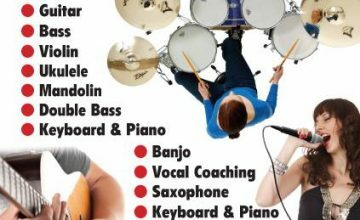 lesson prices £16 for half hour or £30 for the hour. How it all started! I started drumming at a young age being taught the basics by my grand father in the early days on an old snare drum. I progressed having more lessons on full drum kits also attending lessons on the reading of drum notation. I embarked on teaching the drums in 1996 working part time in the evenings and weekends. In 2004 I went full time into the teaching and the name Drum Mechanics was formed by myself Chris Harvey. From refurbishing and tuning drum kits. I also used to travel around covering a wide area of Gloucestershire, Hereford and Worcestershire to teach the Drums in schools and homes. In October 2006 I found a disused unit on pershore trading estate situated under the old water tower built in 1939 as part of the old pershore air base, today it is used as a fire hydrant for the fire brigade. Straight away I got to work creating the studios for teaching also band practice and a workshop for instrument repairs. 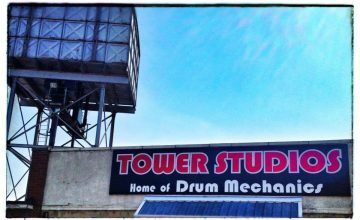 Tower studios the home of Drum Mechanics was born. 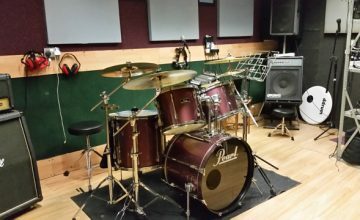 I now have 7 band practice studios all at competitive prices. On site Sales offering excellent deals on Evans, promark, daddario etc. With free tea an coffee a relaxed and chilled environment Tower studios the home of Drum Mechanics for all percussive desires. All day bookings can be arranged at a special rate please speak to Chris Harvey for details. Monday - Friday 6pm - midnight.